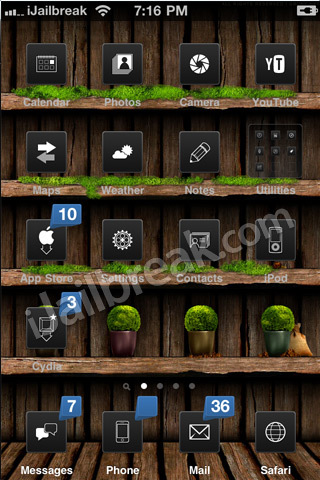 In iJailbreak’s previous how to guide we showed you how to install WinterBoard to your iPhone, iPod Touch or iPad. Today, we are going to be showing you how to take advantage of WinterBoard and actually install a theme to your iPhone, iPod Touch or iPad that will change the appearance of your SpringBoard. This step-by-step guide will show you how to download WinterBoard themes from Cydia, and how to install WinterBoard themes on your jailbroken iOS device. Note #1: If your iPhone, iPod Touch or iPad is not jailbroken you can follow our how to jailbreak guides. Step 1) The first thing you will need to do is launch Cydia from your iPhone, iPad, iPod Touch’s SpringBoard. 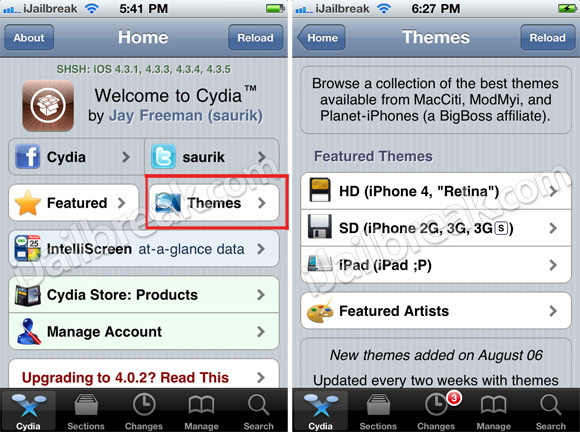 Step 2) The next thing you will need to do is find a theme to install to your iPhone, iPod Touch or iPad. The best way to browse for WinterBoard themes is to go into Cydia tab (which opens by default upon launching Cydia) and clicking the Themes button. Upon doing so you will be re-directed to a page where you will need to select the type of iDevice you are trying to find a WinterBoard theme for. Once you do this you will be presented with a list of Paid and Free WinterBoard themes to download. 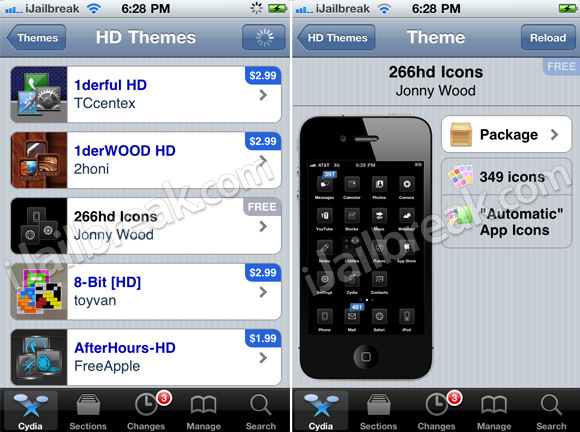 In this how to guide we will be installing the 266hd Icons theme, however, you are free to install whichever theme you like. Step 3) When you find a theme you wish to install click the package button and you will be re-directed to that theme’s information page where you can install the theme. Tap to install the theme now. Step 4) When the theme finishes installing you will need to press the Return to Cydia button and then press the Home button to return to your SpringBoard. 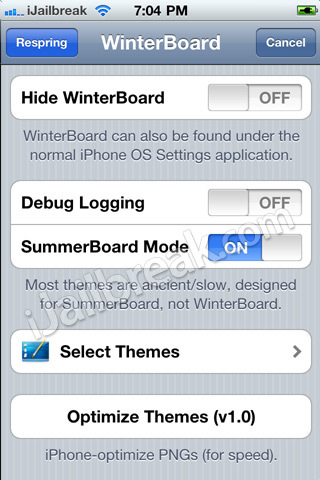 Step 5) Now tap the WinterBoard icon on your SpringBoard to launch WinterBoard. Step 6) When WinterBoard is up and running go into the Select Themes tab and tap on the theme you just installed through Cydia. Once you tap on the theme you installed from Cydia tap the WinterBoard button in the top right corner of the screen and you will return to WinterBoard’s homescreen. Upon doing so you will notice a Respring button in the top left corner of the screen. Tap this button now and your iPhone, iPod Touch or iPad will respring to activate your selected theme. When your iDevice resprings, slide to unlock, and you will notice your selected theme has been activated. Congrats! 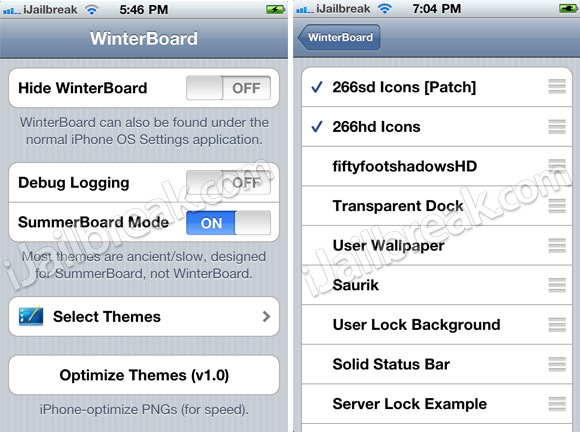 You have just learned how to download and install a WinterBoard theme. WinterBoard is a very powerful theming utility that can handle enabling multiple themes. For example: this can be useful if the specific theme you like only themes your iDevice’s icons but you also want to theme a specific application like the iPod.app. To do this you would simply download the iPod.app theme from Cydia and activate both themes through the Select Themes tab. You may have also noticed that WinterBoard allows you to play around with the order of themes (by tapping to the right of a theme you can change its position). This allows you to better organize your active themes and further customize the layout of your iPhone, iPod Touch or iPad. 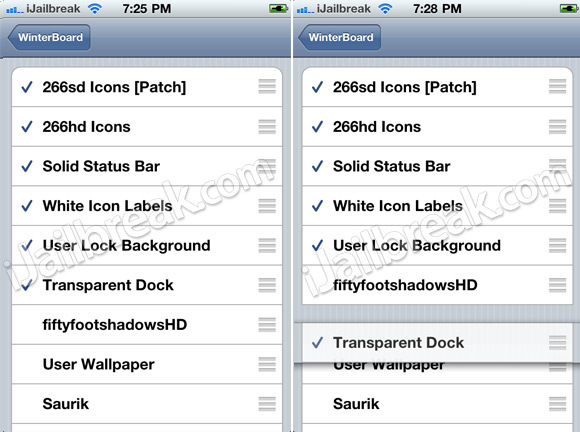 As in WinterBoard themes are prioritized from top to bottom in the theme list of WinterBoard. Meaning the theme at the top of the list will be your main theme and any other themes that are activated will only theme parts of your iDevice that were not themed by your main theme. If you have any questions, thoughts or are coming across some errors/issues, please leave a comment. First sentence should use the the word “show” not “should”. Secondly, you have amazing writing mechanics that keeps the reader glued to your work, so good work and keep it up. However, may I suggest that instead of using the word “last” in the first sentence you use “previous” as I thought that you were speaking of this or the other tut to be the last/final tut you were going to write. Then I would like to show my deep appreciation for your hard work. I know you guys enjoy sharing your knowledge, but I do recognize it is a lot of work, and hours you have to sacrifice from family, school, or work. So a big THANK YOU there. The site is becoming a one stop source for everything iOS. I got a quest where can i download winterboart?? First you have to jailbreak your device then go to the cydia app and click search and write winterboard a blue app with snowflakes should come up click tht nd install enjoy! When I enable themes on my iphone, they dont seem to fully take over. My lock screen is still the same and such.